You may have heard that BT are starting to install new fibre-optic broadband infrastructure to enable speeds to exceed the typical maxcimum of 20Mbit/s that is currently possible over a copper telephone line. 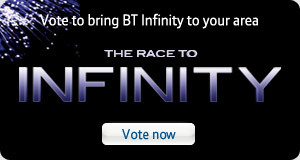 The new service - named BT Infinity - is being targeted for install in a number of city and urban areas. However, Chorleywood is not one of them (Amersham and Watford are included at this stage). Whilst a considerable part of the village is enabled for Virgin Media cable services, there are significant parts of Chorleywood that cannot get Virgin Media services and the whole community could benefit from faster broadband speeds from BT. BT have launched a voting system whereby local communities can register their support for installing faster broadband in their areas, a bit like the pre-registration system that existed when ADSL was first installed in BT Exchanges. This initial stage of voting will be for 5 exchanges to obtain broadband, but there's a good chance that the level of voting will also influence delivery of broadband to communities once the initial phase of deployment is complete. You can visit the voting site here and the Residents' Association would recommend that all local residents do this irrespective of their current telephone and broadband provider. Update: Although we're mostly all 01923 numbers, it depends what exchange you're connected to whether you'll be able to benefit from the Infinity upgrades. If you're connected to Rickmansworth Exchange you'll find that it will tell you that you're already included in the rollout plan (the expected upgrade date is set as end September 2011). The website will tell you when you put in your postcode and/or phone number. The Chorleywood exchange needs as many votes as possible!